High-voltage measurement systems | CSM Products, Inc. Measurement on high-voltage components with certified safety – in test drives and in test benches: CSM high-voltage measurement systems are specifically designed for the safe and accurate acquisition of temperatures (Type K, PT100, and PT1000) and analog signals in HV environments, especially in electric and hybrid vehicles. Measurement systems from CSM enable HV-safe measurement chains from the sensor to data acquisition. They ensure fast installation as well as precise and reliable measurement results over the entire operating temperature range. By using CSM measurement systems, high voltage safe measurement chains can be set up, from the point of measurement to the data acquisition. Each component is subjected to a routine test prior to shipment. The double-insulated multi-channel cables also play an important role in the system. These cables are pre-assembled with fully insulated plastic connectors. With each multi-channel cable up to four points of measurement can be safely connected to a measurement module. This reduces time and costs for cabling. In addition, the double insulation increases the protection against damage caused by chafing. The inner insulating layer is colored blue, so that damaged cables can be detected before a hazard to the user arises. HV-safe measurement modules for test drives and test benches. The multi-channel cable with fully insulated plastic connector provides a reliable connection of the whole measurement system. A specifically designed cross-section provides additional safety. With its HV AD measurement modules, CSM has designed safe all-round measurement devices for standard sensors with analog voltage outputs as well as for direct voltage measurements in high-voltage environments. The HV IEPE3 FL1000 has been specifically designed for measuring analog voltages with IEPE sensors, e.g. triaxial accelerometers, in high-voltage environments. CSM's measurement modules HV PT MiniModule (HV PTMM) and the HV PT test bench module (HV PT-TBM) allow precise temperature measurements with PT100 and PT1000 resistance sensors in a high-voltage environment. Safe temperature measurements with thermocouples on high-voltage components: the high-voltage-safe temperature measurement modules HV THMM 4 and HV TH-TBM 8 are specifically designed for the reliable acquisition of temperatures in electric and hybrid vehicles. 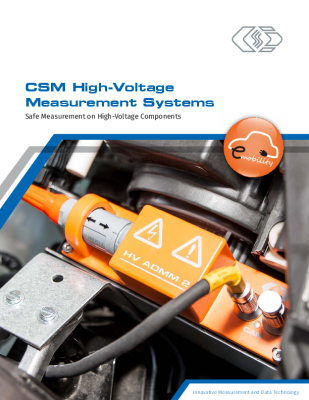 Safe high-voltage measurements in test benches: With the 19-inch slide-in modules, CSM has created an effective product portfolio for the safe measurement of analog voltages, currents, pressures, humidity and temperatures on high-voltage components in test benches and also in vehicles. The high risk potential during measurements in high-voltage environments requires an enhanced safety awareness. This means: The user’s life and health should be put in the fi rst place.